STOP!! If you are the abatement professional you cannot complete claim forms for your customers. Please have the customer fill the claim form out online under their own email address or complete and submit the printable claim form! 1. 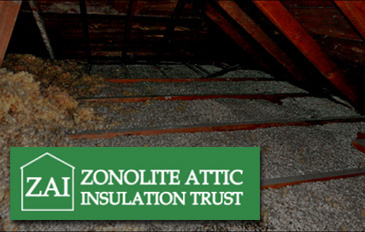 Before you do an asbestos abatement job, please consider the ZAI Trust requirement that the claimant be able to prove that the vermiculite was the Zonolite brand. This can be accomplished by sending us a sample which we will have analyzed to determine if it is consistent with Zonolite. Failing to do this could result in the claimant not qualifying for partial reimbursement. If you find a Zonolite bag or a portion of a Zonolite bag, please take a photograph(s) of the bag or portion of the bag in the structure where it was discovered. You must also sign a certification stating the bag or portion of a bag was found in the structure as shown in the photograph(s). The photograph(s), along with the certification, may be submitted as evidence that the vermiculite is the Zonolite brand. YOU ARE POTENTIALLY DOING A DISSERVICE TO YOUR CLIENT IF YOU ASSURE HIM THAT HIS VERMICULITE QUALIFIES FOR REIMBURSEMENT BEFORE THE TRUST HAS REVIEWED THE PRODUCT IDENTIFICATION REQUIREMENT. 2. We appreciate your commitment to professionalism, excellent industrial hygiene practices, and fraud prevention. Towards those ends, the Trust is requiring “before-and-after” pictures of the vermiculite/attic prior to and subsequent to the abatement. We would appreciate it if you would take and include the pictures with the documentation that you provide the homeowner since it will become a part of the claim file and documentation that we consider in the evaluation process. Failing to provide these pictures may compromise your client’s claim. For your future vermiculite removal jobs, be sure to advise the customer of the existence of the Trust. It may make the difference in his decision to move forward with the removal. The Trust takes fraud and attempted fraud very seriously and under some circumstances is required to report fraud or suspected fraud to the U.S. Bankruptcy Court. The Trust will investigate suspicious claims and apply heightened scrutiny as it deems warranted. Fraud and Conspiracy to Commit Fraud are violations of both state and federal laws and can subject a claimant and/or anyone participating or assisting in the fraud to both civil and criminal penalties. Additionally, a professional (and his company) suspected of assisting a claimant with a fraudulent claim will also be reported to the state licensing board. From time to time the Trust is asked for recommendations or advice regarding the hiring of an asbestos abatement contractor. The Trust is not in a position to give such recommendations regarding the quality, licensing, or business practices of any particular company. Rather, the Trust encourages claimants and homeowners to do their own research and utilize the resources of their own state and local agencies in determining whether any particular contractor has the appropriate licensing and certifications. As a convenience, the Trust has listed below the membership list (sorted by state) and contact information for abatement contractors as provided by the Environmental Information Association as of February 2016. The Trust makes no representation as to the accuracy of the contact information or qualifications of any company included in the list, nor does the inclusion of the list on this website imply any endorsement of any individual company.